RankPay Review: Is Writing Blog Posts for RankPay a Scam? RankPay will help you gain exposure as a blog writer, and will pay you $50 for your blog post! They are looking for writers who can cover SEO, content marketing, and social media. They want engaging, actionable posts that are easy to read and include good stats and images. Writing for RankPay won’t keep you busy as a freelance writer. If you’re interested in making a part or even full-time income writing, we highly recommend the course at 30 Days or Less To Freelance Writing Success. It will teach you how to find your own high paying clients to build a large freelance writing income! In this review, I will explain how it works and how to submit your posts. If your blog post meets their standards and is the kind of content they want, RankPay will respond to let you know that your article will be published. They say that process could take up to 2 weeks. Also, due to the number of posts they receive, they most likely will not respond if they don’t want to use your blog post. I know it can be frustrating to wait for two weeks and then to hear nothing in return. I suggest that you set yourself a reminder so that if two weeks pass by, or 3 to be safe, you can submit your post elsewhere to be published. Or you could start publishing for yourself in your own blog! Brok has had great success with his blog. This is the course he highly recommends if you want to start your own blog! How Much Does RankPay Pay for Blog Posts? RankPay will pay you $50 for your blog post. Remember it needs to be a minimum of 1,000 words and has to meet the requirements above. Your schedule with RankPay is completely your own. If you want to send in a post, you’ll write it anytime you want and send it in. So your schedule should never be an issue with RankPay. I found a lot of feedback for RankPay users. People use RankPay to help them get better ranking in a Google search. But I didn’t find any feedback from people who have written for RankPay and received their $50 payment. What I saw on the RankPay blog is that most posts were from the same person, except for a couple “guest authors.” This makes me a little unsure about who you’re writing for. It sounds like you’re writing for the RankPay blog, but then who is writing for their clients? I did contact an author of one of the sample articles. I hope to hear back from her, at which time I will update this post with a little more info! Is Writing Blog Posts for RankPay a Scam? Even with some unanswered questions, I still believe that writing for RankPay is not a scam. But I would only try this if writing about SEO is second nature for you and you’re sure you can give them what they want. If you want to give it a try, follow the instructions above to submit your original article to marketing@rankpay.com. 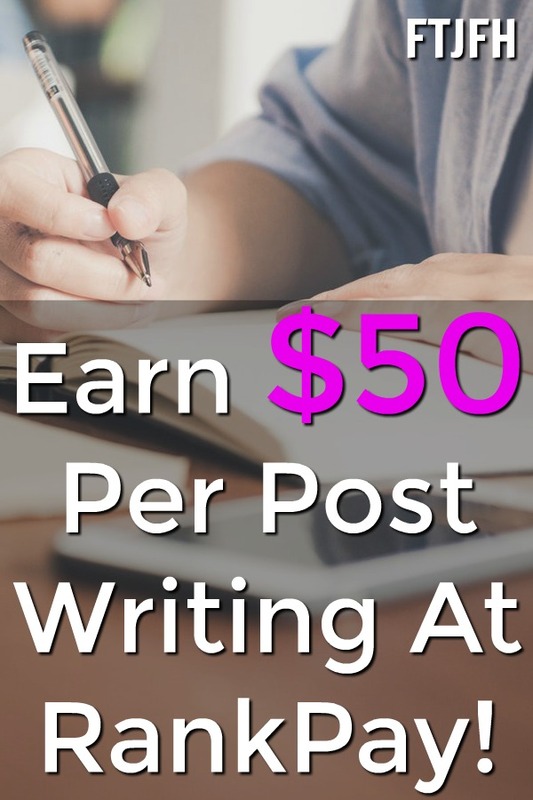 If you’re interested in making a part or even full-time income writing, we highly recommend the course at 30 Days or Less To Freelance Writing Success. It will teach you how to find your own high paying clients to build a large freelance writing income!